Italy will head into Sunday's Pool C shoot-out with Ireland as underdogs - and for good reason. Not only did Ireland beat pool favourites Australia in the second round of matches, but they have a track record of success against the Azzuri. In 19 internationals Ireland have won 16 and lost just three. In fact, despite some close encounters in recent years, Ireland have not lost to Italy for 14 years and have a 15-match winning streak against their Six Nations rivals. Italy's three victories against the Irish came within their first four meetings. After Ireland won the first match-up between the sides at Lansdowne Road in 1988, the Azzuri gained revenge with wins in Treviso, Bologna and Dublin. But since then the Irish have dominated. 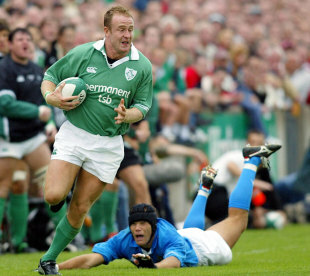 The high-point of Irish dominance came in August 2003 when Ireland ran in eight tries, including four from winger Denis Hickie, to beat Italy 61-6 in Limerick. Despite regularly coming up against each other in the Six Nations, Sunday's showdown in Pool C will be the first time the two nations have met in a Rugby World Cup. The last meeting between the two sides came in Rome in February when a 77th minute drop goal from fly-half Ronan O'Gara, who came on as a second-half substitute, snatched a 13-11 victory for Ireland.